Gene Silvis, CLU, ChFC, ARPC has been assisting people with their estate and retirement planning since 1969. He has been a New York Life agent since 1973, and the manager of the Life & Group department of Rich & Cartmill, Inc. since 1983. Gene believes continued education and staying current is extremely important. He holds the Chartered Life Underwriter and the Chartered Financial Consultant designation from the American College in Bryn Mawr, Pa. He also is an Accredited Retirement Planning Consultant. He is a member of the National, Oklahoma, and Tulsa Association of Life Underwriters. Current member of the American Society of CLU & ChFC’s, and is past president of the Tulsa Chapter of CLU & ChFC’s. Current member of the Tulsa Estate Planning Forum. Gene has conducted seminars on Successful Money Management at the University of Tulsa, and Financial Strategies for Successful Retirement at Oklahoma State University. Active in community affairs, Gene is a past member of the Jenks America Kiwanis, and has twice been president of that organization. 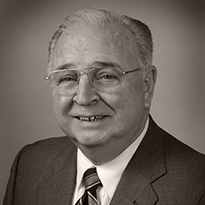 He served as chairman of the basic needs committee for the Tulsa Area United Way for seven years. He has served as a volunteer and as training co-ordinator for the Court Appointed Special Advocate (CASA) program in Tulsa. Gene and Pam (his wife of 55 years) are members of the Liberty Baptist Church in Tulsa. Gene and Pam live in Tulsa, Oklahoma. They have three grown children and three grandchildren. When he has time, Gene enjoys reading, fishing, computer war games and is a Private Pilot. ©2019 Rich & Cartmill, Inc. | All rights reserved.